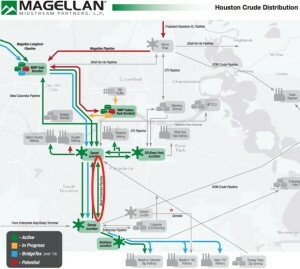 Magellan Midstream Partners has acquired a 15-mile, 16-inch Houston area pipeline from Shell. The pipeline is bi-directional, with capacity of 150,000 b/d. The pipeline moves crude from Genoa Junction to/from a Magellan terminal in East Houston. The company stated, "The West Columbia pipeline will provide an additional route for crude oil, particularly barrels from the Eagle Ford, to reach our East Houston terminal for storage or subsequent delivery into Shell’s reversed Ho-Ho system." Neither Magellan Midstream nor Shell released the financial details of the transaction.